" National Flag Anthem of the Republic of China"
The Republic of China (ROC) ruled the Chinese mainland between 1912 and 1949. It was established in January 1912 after the Xinhai Revolution, which overthrew the Qing dynasty, the last imperial dynasty of China. Its government moved to Taipei in December 1949 due to the Kuomintang's defeat in the Chinese Civil War. The Republic's first president, Sun Yat-sen, served only briefly before handing over the position to Yuan Shikai, leader of the Beiyang Army. Sun's party, then led by Song Jiaoren, won the parliamentary election held in December 1912. Song Jiaoren was assassinated shortly after and the Beiyang Army led by Yuan Shikai maintained full control of the Beiyang government. Between late 1915 and early 1916, Yuan Shikai proclaimed himself as Emperor of China before abdicating due to popular unrest. After Yuan's death in 1916, the authority of the Beiyang government was further weakened by a brief restoration of the Qing dynasty. Cliques in the Beiyang Army claimed their autonomy and clashed with each other during the ensuing Warlord Era. In 1921, Sun Yat-sen's Kuomintang (KMT) established a rival government in Canton, supported by the fledgling Communist Party of China (CPC). 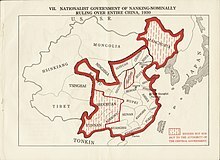 The economy of North China, overtaxed to support warlord adventurism, collapsed between 1927 and 1928. General Chiang Kai-shek, who became KMT leader after Sun's death, started the Northern Expedition in 1926 to overthrow the Beiyang government, which was accomplished in 1928. In April 1927, Chiang established a nationalist government in Nanking, and massacred communists in Shanghai, which forced the CPC into armed rebellion, marking the beginning of the Chinese Civil War. At the end of World War II in 1945, the Empire of Japan surrendered control of Taiwan and its island groups to the Allies, and Taiwan was placed under the Republic of China's administrative control. The communist takeover of mainland China in the Chinese Civil War in 1949 left the ruling Kuomintang (KMT) with control over only Taiwan, Penghu, Kinmen, Matsu, and other minor islands. 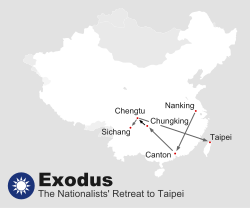 With the 1949 loss of mainland China in the civil war, the ROC government retreated to Taiwan and the KMT declared Taipei the provisional capital. The Communist Party of China took over all of mainland China and founded the People's Republic of China (PRC) in Beijing. Yuan Shikai ( left) and Sun Yat-sen ( right) with flags representing the early republic. After Sun's death in March 1925, Chiang Kai-shek became the leader of the KMT. In 1926, Chiang led the Northern Expedition through China with the intention of defeating the Beiyang warlords and unifying the country. Chiang received the help of the Soviet Union and the Chinese Communists; however, he soon dismissed his Soviet advisers. He was convinced, not without reason, that they wanted to get rid of the KMT (also known as the Chinese Nationalists) and take over control. Chiang decided to strike first and purged the Communists, killing thousands of them. At the same time, other violent conflicts were taking place in China; in the South, where the Communists had superior numbers, Nationalist supporters were being massacred. These events eventually led to the Chinese Civil War between the Nationalists and Communists. Chiang Kai-shek pushed the Communists into the interior as he sought to destroy them, and established a government with Nanking as its capital in 1927. By 1928, Chiang's army overturned the Beiyang government and unified the entire nation, at least nominally, beginning the so-called Nanjing Decade. According to Sun Yat-sen's theory, the KMT was to rebuild China in three phases: a phase of military rule through which the KMT would take over power and reunite China by force; a phase of political tutelage; and finally a constitutional democratic phase. In 1930, the Nationalists, having taken over power militarily and reunified China, started the second phase, promulgating a provisional constitution and beginning the period of so-called "tutelage". The KMT was criticized for instituting authoritarianism, but claimed it was attempting to establish a modern democratic society. Among other things, it created at that time the Academia Sinica, the Central Bank of China, and other agencies. In 1932, China sent a team for the first time to the Olympic Games. Laws were passed and campaigns mounted to promote the rights of women. The ease and speed of communication also allowed a focus on social problems, including those of the villages. The Rural Reconstruction Movement was one of many which took advantage of the new freedom to raise social consciousness. During World War II, the United States has become increasingly involved in Chinese affairs. As an ally, it embarked in late 1941 on a program of massive military and financial aid to the hard-pressed Nationalist Government. In January 1943, both the United States and the United Kingdom led the way in revising their unequal treaties with China from the past. Within a few months a new agreement was signed between the United States and the Republic of China for the stationing of American troops in China for the common war effort against Japan. In December 1943 the Chinese Exclusion Acts of the 1880s and subsequent laws enacted by the United States Congress to restrict Chinese immigration into the United States were repealed. 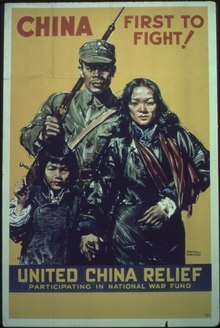 The wartime policy of the United States was initially to help China become a strong ally and a stabilizing force in postwar East Asia. As the conflict between the Kuomintang and the Communists intensified, however, the United States sought unsuccessfully to reconcile the rival forces for a more effective anti-Japanese war effort. Following the Surrender of Japan, the administration of Taiwan was handed over from Japan to the Republic of China on 25 October 1945. Toward the end of the war, United States Marines were used to hold Beiping (Beijing) and Tianjin against a possible Soviet incursion, and logistic support was given to Kuomintang forces in north and northeast China. To further this end, on 30 September 1945 the 1st Marine Division arrived in China, charged with security in the areas of the Shandong Peninsula and the eastern Hebei province. During the war, China was one of the Big Four Allies of World War II and later became the Four Policemen, which was a precursor to the United Nations Security Council. During the civil war both the Nationalists and Communists carried out mass atrocities with millions of non-combatants killed by both sides. Benjamin Valentino has estimated atrocities in the Chinese Civil War resulted in the death of between 1.8 million and 3.5 million people between 1927 and 1949. Atrocities include deaths from forced conscription and massacres. Mongolia Area (Outer Mongolia) 蒙古 Ménggǔ 蒙 méng Kulun (now Ulaanbaatar) 庫倫 Now part of the State of Mongolia. The Nationalist Government recognized its independence in 1946, but overturned previous recognition in 1953. In 1937, Japan invaded China and the resulting warfare laid waste to China. Most of the prosperous east China coast was occupied by the Japanese, who carried out various atrocities such as the Nanjing Massacre in 1937. In one anti-guerilla sweep in 1942, the Japanese killed up to 200,000 civilians in a month. The war was estimated to have killed between 20 and 25 million Chinese, and destroyed all that Chiang had built up in the preceding decade. Development of industries was severely hampered after the war by devastating conflict as well as the inflow of cheap American goods. By 1946, Chinese industries operated at 20% capacity and had 25% of the output of pre-war China. The original military power of the Republic of China was inherited from the New Army, mainly the Beiyang Army. The Beiyang Army later split into many warlords and attacked each other. 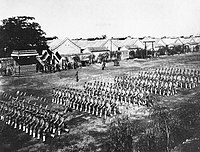 The National Revolutionary Army, which was established by Sun Yat-sen in 1925 in Guangdong with the goal of reunifying China under the Kuomintang. Originally organized with Soviet aid as a means for the KMT to unify China against warlordism, the National Revolutionary Army fought major engagements in the Northern Expedition against the Chinese Beiyang Army warlords, in the Second Sino-Japanese War against the Imperial Japanese Army, and in the Chinese Civil War against the People's Liberation Army. This page is based on the Wikipedia article Republic of China (1912–1949); it is used under the Creative Commons Attribution-ShareAlike 3.0 Unported License (CC-BY-SA). You may redistribute it, verbatim or modified, providing that you comply with the terms of the CC-BY-SA.